In October 2009 I had the chance to be one of the participants that took part into the Open EdTech Summit 2009: Exploring Learning Solutions Together. Access to high-quality education should be available to all, and open content is a key part of providing such access. Informal learning and mentoring are effective and well-proven approaches to engaging with youth and stimulating critical thought. Personalized learning is critical to student success, but will require learning standards that allow students to continue their learning where ever life takes them. Tools such as digital video, mobile devices, social media, and the global network all have important roles in learning and should be available to all learners. We must encourage the reuse and remixing of rich media. We must embrace the full promise of mobile devices as learning platforms. We must award credentials based on learning outcomes. We must enable a culture of sharing. We must take care that open resources include the context that will enable their use and understanding. Though I subscribe to the aforementioned points — I was there and I really do —, some shades of meaning have escaped this necessary but short summary of the debates that took place (formally or informally) during two days. A possibility to detach content from the container: the digital revolution has made possible to separate books (paper) from what it’s told in them. Unbundling opens a new way to understand content and knowledge. But, this unbundling also applies to knowledge holders per excellence: teachers. Digitizing is to books what telecommunications are to people: everyone’s knowledge is at a click’s range. Thus, why should I stick to a bunch of people (i.e. Faculty)? A claim to detach learning from institutions: if content can now be found (and retrieved and copied) from anywhere, and if we can get rid of a closed, limited, selected group of individuals, why stick to their “holder”, the institution? If there is abundance of content and knowledgeable people, how do universities, schools, libraries, etc. still make sense? An effort to detach the object from the supporting structure: but it’s not only about content and people and institutions. Why (oh, why on Earth) should a specific institution give credit for what I’ve learnt? How did that got credit for that? Why, if I learn 24×7 (because my brain just won’t stop — what I learn is another debate), should I limit my learning to a specific place (school, university…) and a specific time (class hours)? Why building artificial scarcities and barriers when there’s (almost) none? I’m not expressing here a personal wish — though I find most of these questions really appealing and even compelling — but an underground roar that is increasingly becoming mainstream, not only in education with the edupunk “movement”, but also in other fields like e-Government and e-Democracy. We are witnessing a move towards de-institutionalization, from an education that works for the institution towards institutions that work for education, or from a democracy that works for parties and governments or parties and governments that work for democracy. But, as always, the interesting question is not what is happening, but why. Why all this being fed up with institutions? What is the problem with them? And, moreover, why still so many people — especially policy-makers — are so deaf to hear (not to speak about listening to and reflecting about) and address these questions? The problem with tampering with education is that the results (a) are unpredictable (because of the complexity of the subject) and (b) will only show up in the long term, when the harm (and a big one) has already been made. I think the movement towards openness and de-institutionalization in education is unstoppable (time will tell, though). So institutions (governments, universities, schools, parents associations, etc.) would better accompany the movement, so to avoid that people that exit institutions just find themselves out in the void, and try instead to engage in a debate to move towards a planned de-institutionalization or, at least, re-institutionalization. 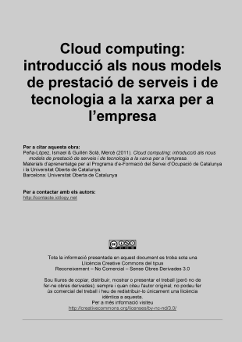 Notes from Tim Berners Lee’s investiture ceremony as doctor honoris causa, Open University of Catalonia, Barcelona, October 10th, 2008. Quoting Tim Berners-Lee (TBL): the World can be seen as just connections, nothing else . Net neutrality has to be maintained as one of its genuine foundations, not to create a new digital divide amongst the ones that can freely surf the Internet and those who cannot. The Web is just a platform for people to do new things . Lots of things that happen on the web are there just because someone else let them happen, and let people go on with their ideas… just like the Web, that in a first draft was dubbed as vage… but exciting . Keeping one web is important, securing that computers still speak the same language, the same protocol, one to each other. Why does the web work? Because one person puts a link, and somebody else follows it. So, understanding people is (or should be) the first step in computer science and, indeed, in designing and developing the Web of the next years. This is the aim of Web Science, to gather under the same roof computer scientists, who know about computers, and other disciplines, the ones who know about people. Web Science is about bridging the people that understand technology and people that understand people. Technology is created for the sake of Humanity, not the other way. As said, UOC‘s research institute, the Internet Interdisciplinary Institute, offers 10 grants for full-time PhDs that are carried out physically in its headquarters in Castelldefels’s Mediterranean Technology Park (20 minutes from Barcelona). It carries a stipend and access to travel funds. Please visit the PhD programme‘s website, for detailed information about the places on offer and the fellowships.